As it might be obvious from the name, a complaint form is one that allows a user to file a complaint against another person or an organization. A complaint form is usually designed in such a way that it contains important segments that encourage the user to share his/her experience in the most profound manner. 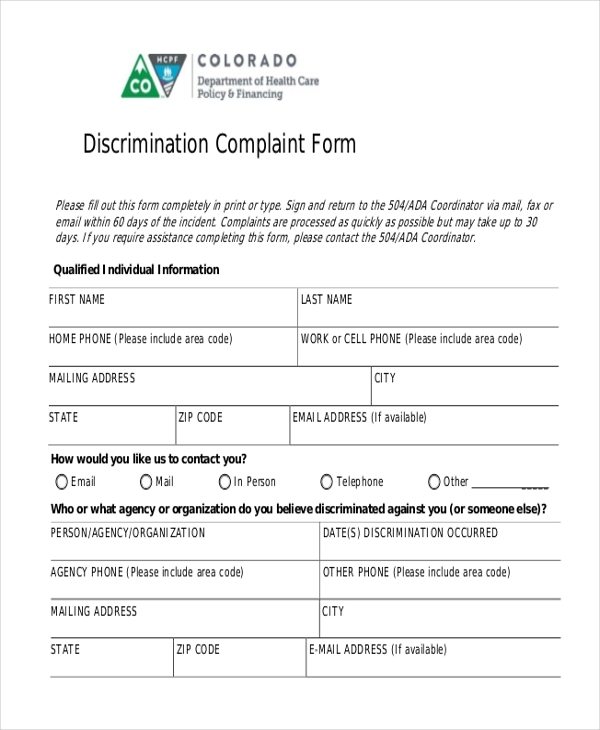 Use of this form simplifies the whole complaint processing mechanism for the department that may be responsible for looking into these matters. 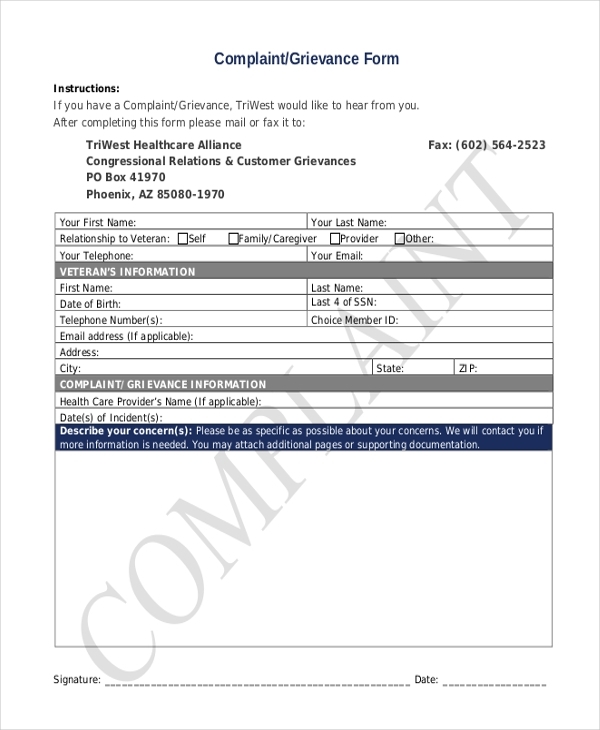 A blank complaint form is nothing but a framework or outline of how a complaint form should look. It contains the various important segments that should be a part of such a form. The users can make changes to the form according to their needs. 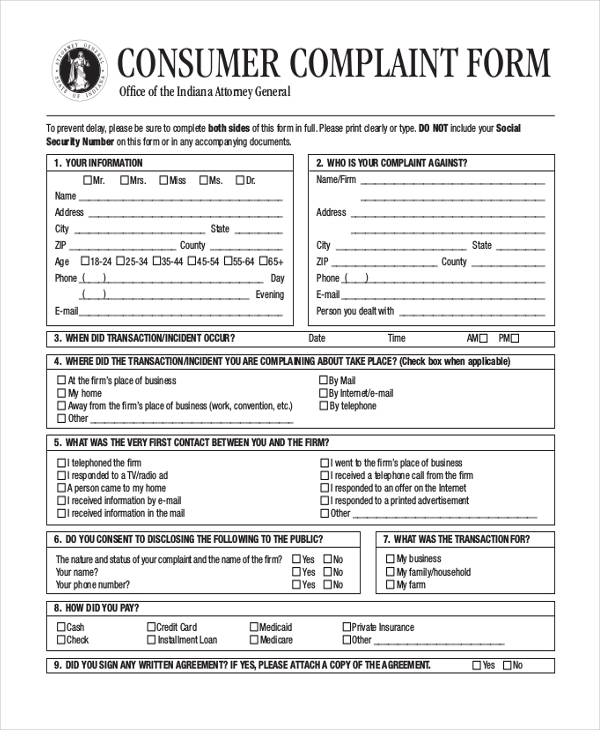 A customer complaint form allows the customers of a service organization to raise a complaint against the staff or the services offered to them. They can use this form to elaborate on their experiences. This form is mainly used by business organizations to enable their consumers to come forth with any consumer protection complaints or raise a concern about the products or services offered by the organization. 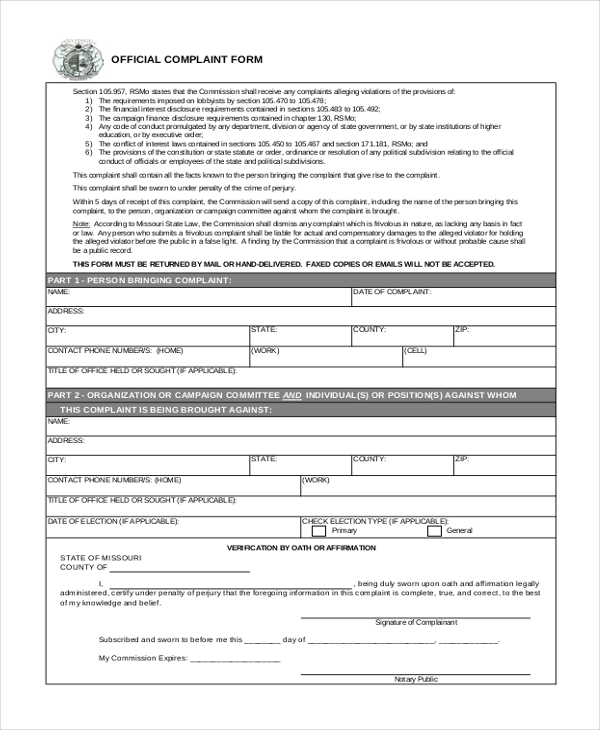 As the name indicates, this form is used by a company to allow its employees to submit a written complaint about any concern that they may have with the organization or a higher personnel. This is a standard complaint form which can be used by anyone to design a unique form for any organization. It contains all the important segments that a complaint form should include. A gym complaint form, is obvious from the name, is used by the gym authorities to enable their patrons to file a complaint against the facilities offered or the employees working in the gym. 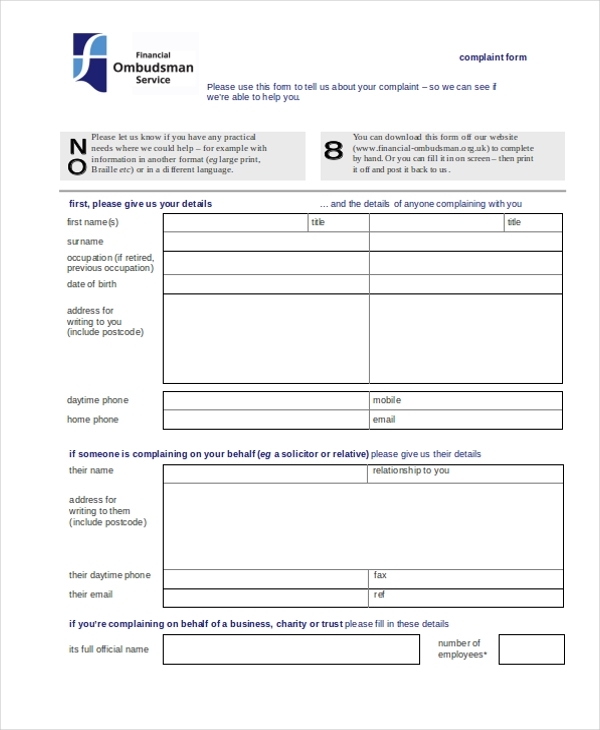 This form is mainly used by a person who may want to report against a legal agency and their services. The person is required to fill in his personal details and his complaint and then submit the form to the authorities concerned. 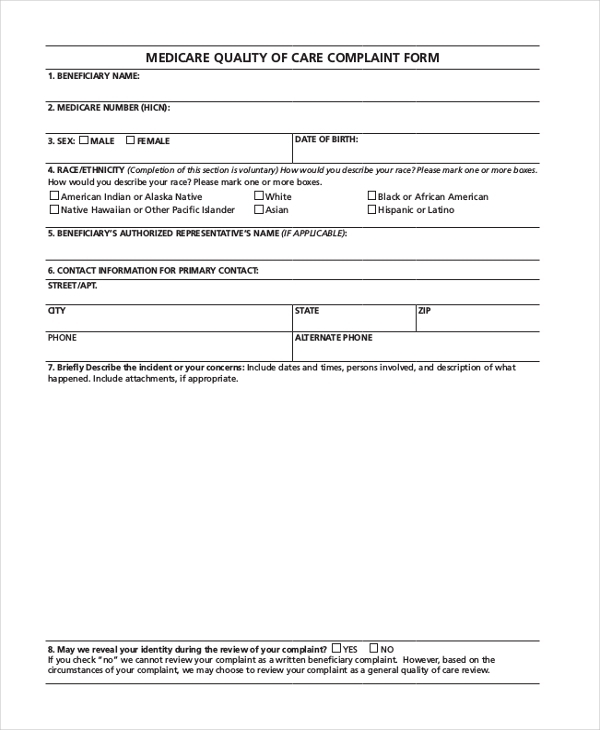 This form can be used by any person who may not be satisfied with the services offered to him by Medicare. 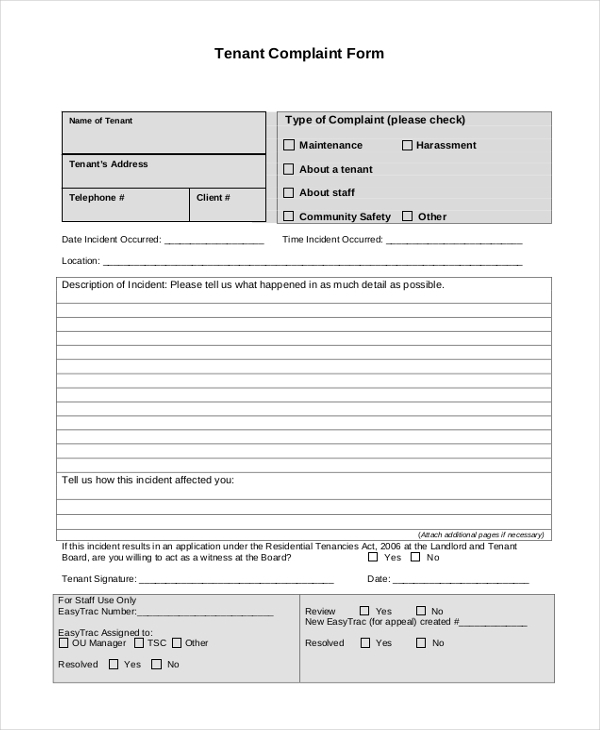 Using this form, he can file a complaint to the concerned authorities by elaborating on the problems faced by him. 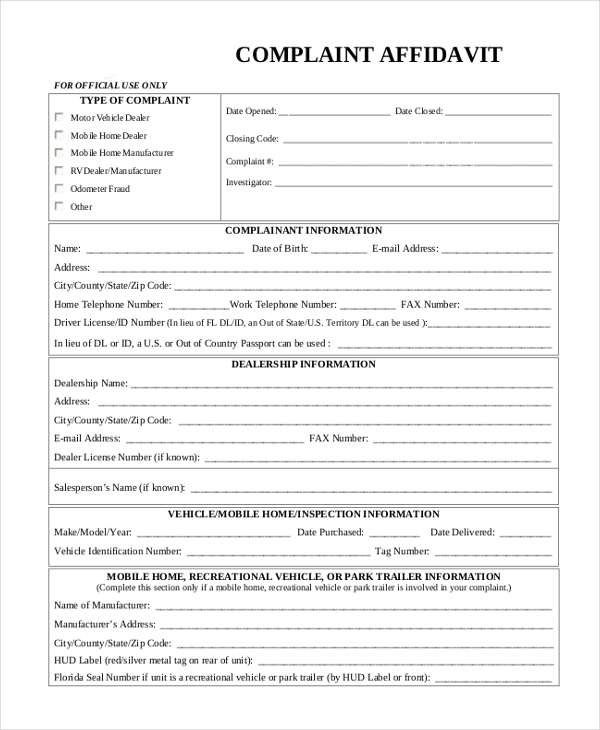 As the name suggests, this form is mainly used by a residential cooperative society or unit to enable its residents to file a complaint against a fellow resident or about any other concerns he may have. 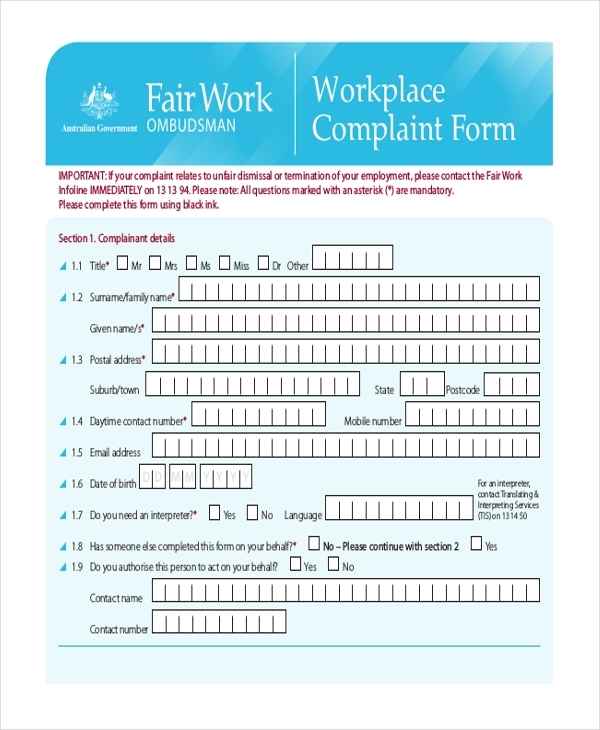 This form gives you an idea of how a complaint form should ideally look. With all the important segments and subheads in place, the user can further make changes to the form as per his need. 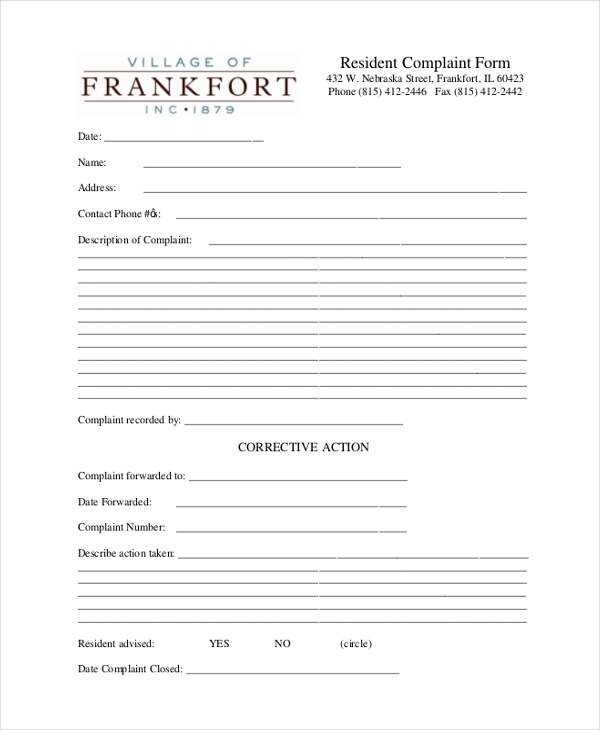 This form can be used by a tenant to file a complaint with the landowner/house owner, regarding any problems or discomfort he might be facing while using the property. 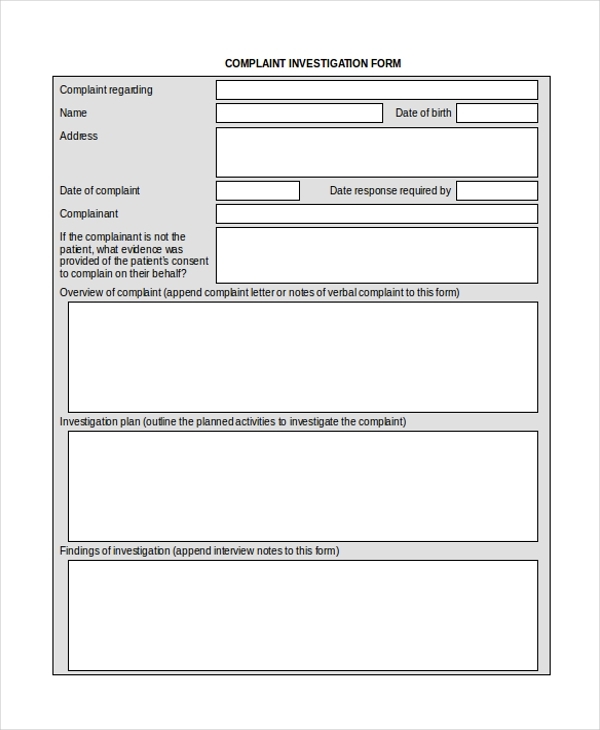 A patient complaint form is used by the hospital authorities to enable their patients to file any complaint that they may face against the staff, services or the facilities offered to them in the hospital. This is an official form which is mainly used by a person to file a complaint against an authority or elected member of a society. He needs to fill in this form and submit it to the higher authorities for action. Service agencies use this form to make the process of filing a mail fraud complaint or the like easier for their clients. The form has segments assigned where the customer can put down his concerns in writing. 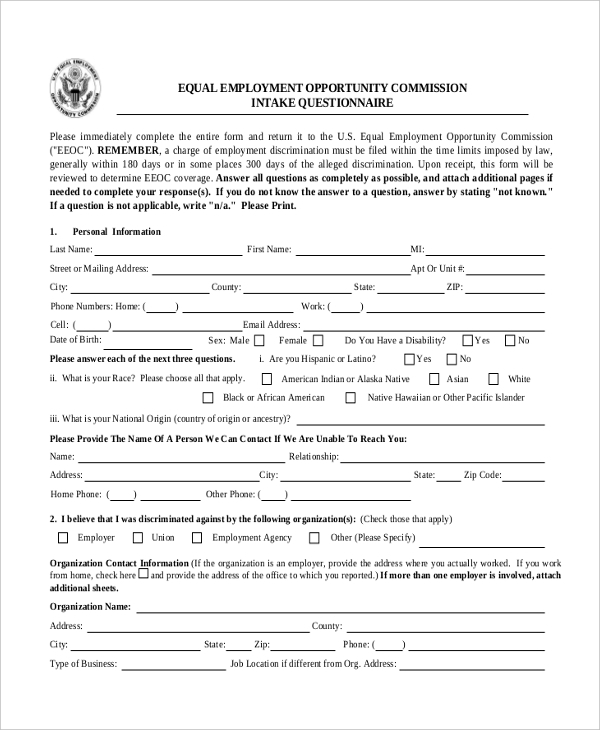 This form can be used by a person to file a complaint against his employer or organization with the labor department. The form once submitted propels the department to take quick action. Whenever a person comes to discrimination based on his/her gender, caste, color or nationality, he can bring this to the notice of the authorities concerned by using a complaint discrimination form. Mainly used by service agencies, they issue this form to their customers who may want to file a complaint against the services offered to them or about a staff member. The form requires them to fill in personal details and the complaint. 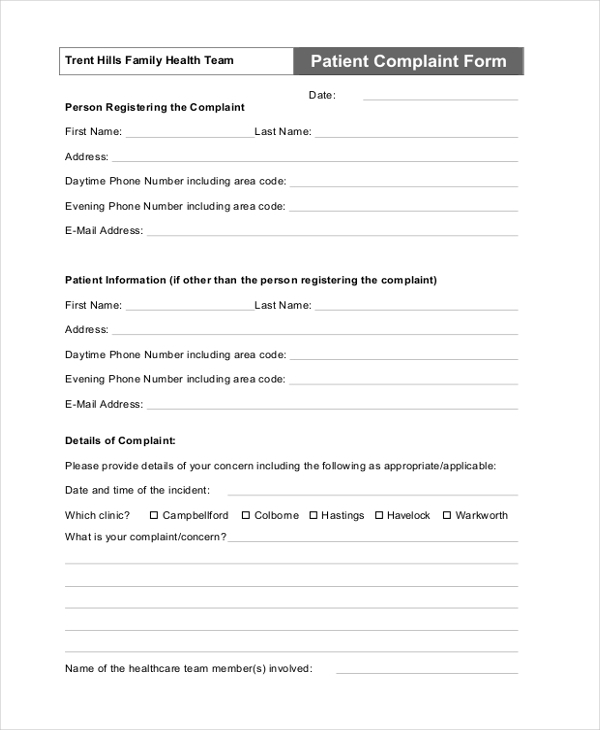 This form is generally used by hospitals and health care agencies to simplify the process of raising a complaint about their patients and clients. The form enables a person to file a professional complaint with the authorities. 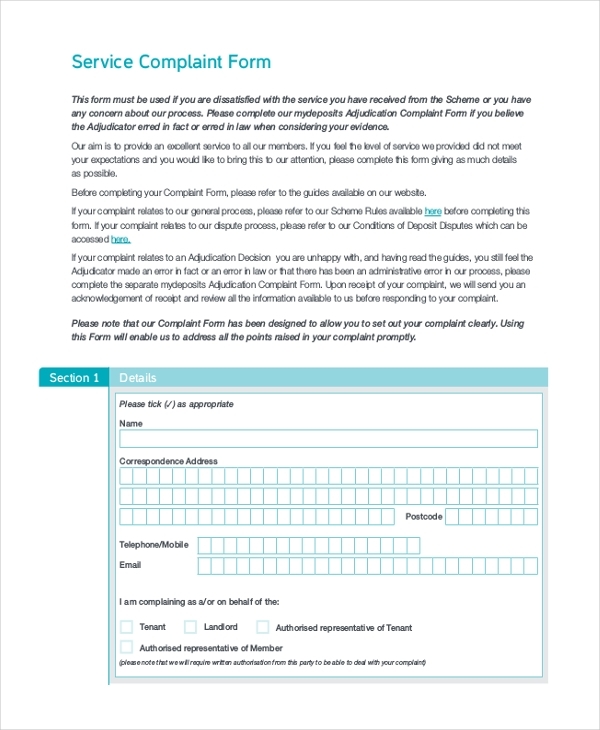 Used by the authority or person who may have been directed to look into a complaint, this form gives a sneak peek into the details of the complaint as well as the person who has raised the complaint. Available in a professional letter format, a complaint letter form can be used by any person to write a formal letter, elaborating his concerns that he may have about certain products or services. 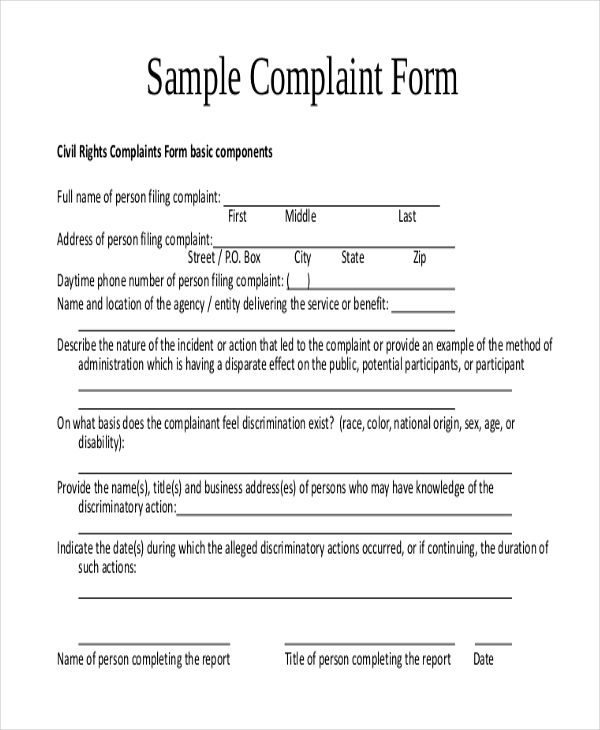 This form can be used by an organization to help a person register a formal complaint with the concerned authorities. The person is required to fill in his personal details and his complaint in the form. Everyone could feel the need to raise a complaint against an organization for the services rendered by it or the quality of its products. Thus, any organization or body which may be working in tandem with people, offering them services could use complaint forms. 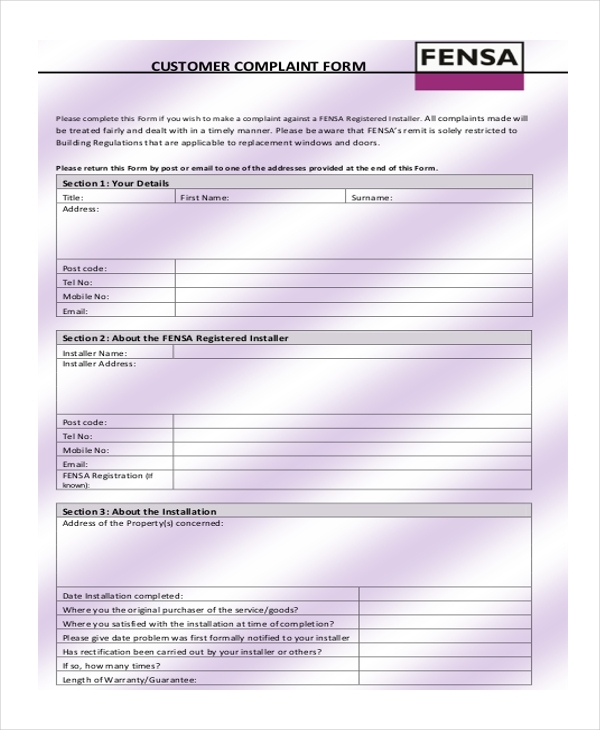 Business Organizations can use a complaint form to enable their customers to raise a complaint against the products or services offered by them.Hospitals/Clinics/Healthcare facilities may use a complaint form to enable their patients to file a complaint against their services or their staff. Government Offices can use the complaint forms to help the citizens raise a complaint against a government official or any other concerns that they may be facing. 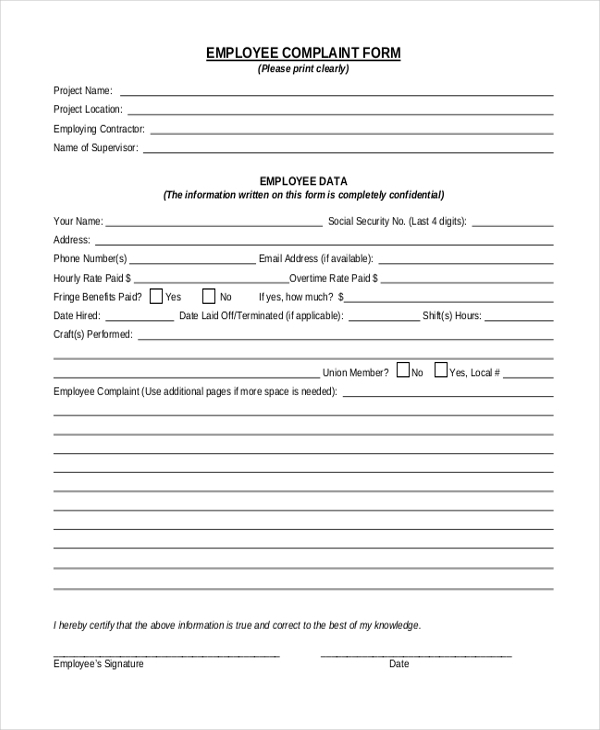 How to Format a Complaint Form? Start by adding the name of your company or agency at the top of the complaint form along with the details like address, phone number etc. This should be followed by a segment which collects the details of the complaint. Leave out a segment where the person can address his complaint in an elaborate way. This should be followed by a space where the person can put down his signature. In case, the complaint is about another person, it would be a good idea to include a segment where the details of this person can be added. Having a unique design for a complaint form can surely simplify things. 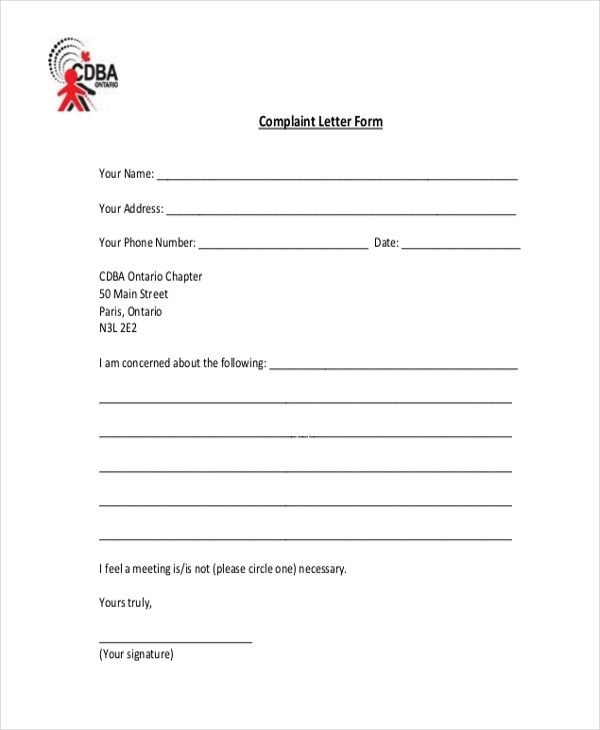 Not sure how to design a complaint form? 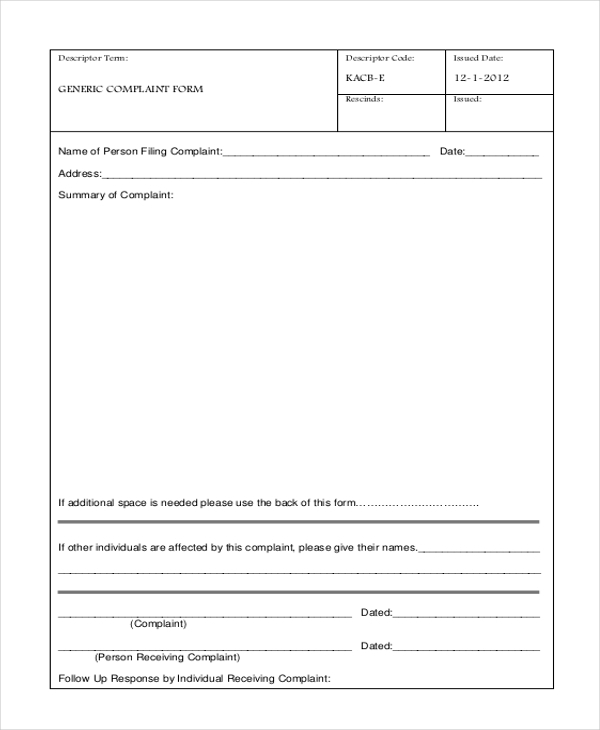 Go ahead and take a look at our vast collection of complaint forms. You are sure to find one that would suit your needs. 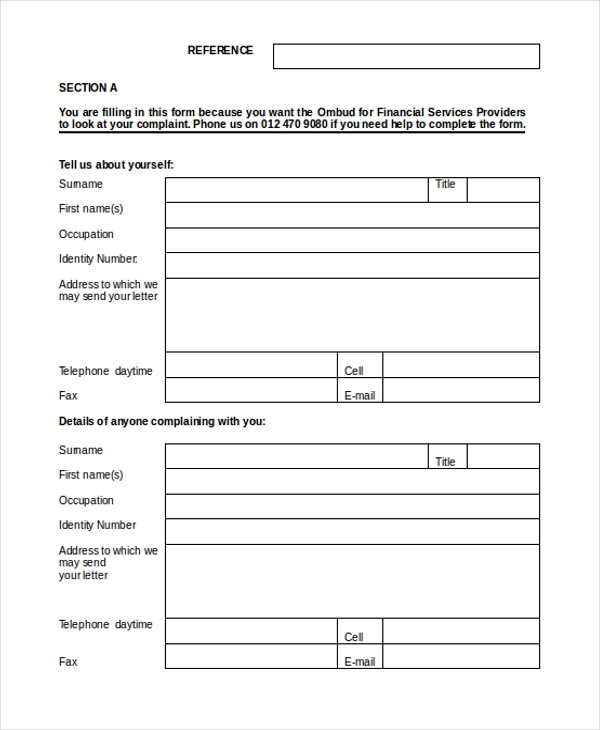 You can easily make changes to the form to personalize it.